Been driving by for nearly a month now and wanted to see what the ice was like. Stopped in the little park area across from Chappell Auto Sales, there was probably close to 8-10 inches of black ice as I didn't have any real means of spudding it an educated guess will have to do. Walked about probably 150 yards or so towards the ramp and it was all safe hard black ice. Thanks for the report. I was curious how it setup with all the rain. Thinking about heading there tomorrow...never been there. Any danger spots to keep away from? Come to the gathering on Feb. 2nd and we will show you the best of The Cove! Getting on can be a little tough some times with the river going up and down, stay away from the state ramp islands and out that way and you will be fine. I'll be there tomorrow too. If you see a gray pop-up shanty, that'd be me. I didnt catch anything, but any day outside is good enough for me. Any gear advice for Barton Cove? Line should be green? grey? recommendations for jigging colors and types of jigs (S pimps or other)? What are you trying to catch? It's not to say that you couldn't catch a trout there but I don't think it's considered a trout fishery. However there are plenty of lakes within a half hour of there that hold trout. So assuming you find a place that holds trout, the answers to your questions are simple: Main line color doesn't matter but I would be using a 4lb fluorocarbon or mono leader and small tungsten jigs with plastics or small spoons like pimples or slender spoons. Lol - no worries - we all start somewhere - Good luck to you! There are trout in the river caught one years ago shad fishing. Have also seen salmon. A bad day of ice fishing is better than any day at work! Would you also like someone to put some fish on your line for you too? It's called fishing , not catching for a reason. I like the small tungstens, like a 1/32, pair with a wax worm or meal worm. I prefer live bait over plastics but plenty of people use plastics successfully. As for color I like chartreuse or gold but its good to have a variety. Dammmm son. The man readily admitted he is a newbi, he is just asking for advice. That is what we are here for. 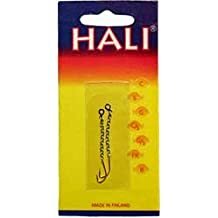 Get yourself one of these Hali's (that color/size) and tip it with a maggot. Buy an extra set of chains (long ones) because they can and do break. With that, you will catch fish on the cove. Hali's are the Gary Yamamoto senkos of ice fishing. IMO they are way over priced, especially with the garbage chain and hook they come with, but they sure do work. Thanks all! They are pricey. This starts me in the right direction and been reading up on old posts on the Hali's and the hook mods.